We are pleased to introduce to you Katherine the Great from Oakland, California, the woman behind Blue Moon Designs and a member of Obtanium Works. Seamstress, librarian, dancer, maker, wannabe badass. Basically, if it involves costumes and/or dancing, I'm so THERE. After rediscovering the joy of playing dress-up after technically becoming a 'grown up', I haven't looked back. 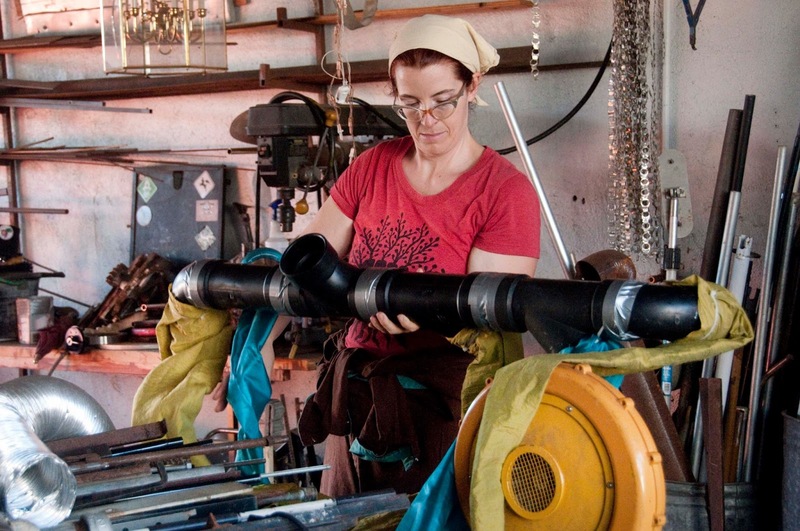 How did you find Steampunk? 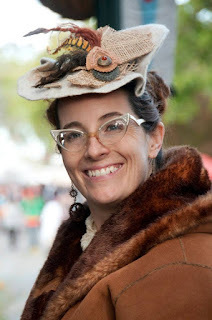 I love telling the story of how I found steampunk, because I think it really captures an important element of how I define steampunk. 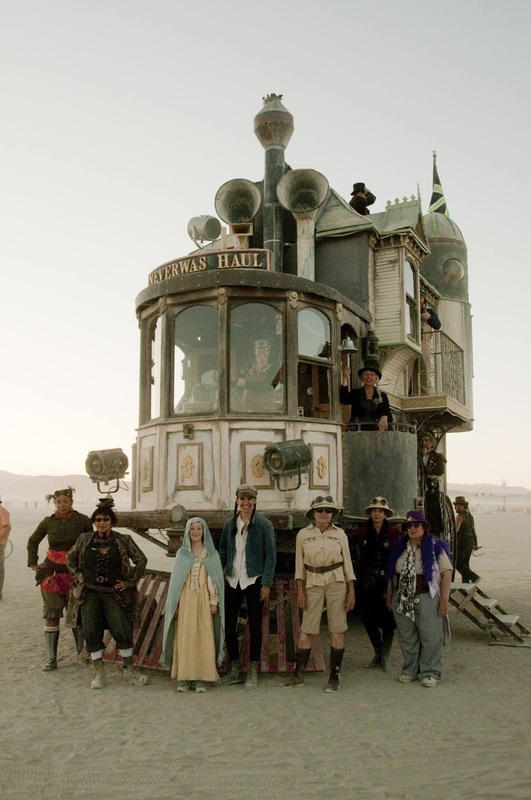 In 2006, which was by the way my fourth time attending Burning Man and a time when my Burning Man costumes involved disco sparkles and bright colors, as if in a dream I encountered the Neverwas Haul, a self-propelled Victorian-style house art car. The house actually drives! The rumor flying around the playa was that you would not be permitted to ride unless you were wearing the proper attire, and upon hearing that my first thought was "Darn it! No one ever told me to bring my Victorian costumes to Burning Man!" It wasn't until the following summer that I even heard the word "steampunk," and immediately I thought of that funny little house/train/car. When I finally found out how to get in touch with the creators of the Neverwas Haul, I sent them probably the most overly-enthusiastic message I've ever written to anyone. They graciously invited me to pay a visit to their workshop in Berkeley, and I've been honored to be a member of the Neverwas crew (whom I now call my "art family") ever since. 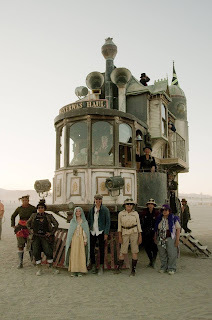 A couple of months ago at Burning Man 2015 I was delighted to command our first excursion with an all-female crew (which is no small feat since it takes 10 trained people to safely operate the Haul). Please describe for us one of your creative processes. A really important part of my creative process is collaboration with other creative people. If I have an idea for a project that is beyond my expertise of what I know how to do, I find it so valuable to ask my friends or people in my network how they would do this or that part of it. A great example of this is The Tea Engine, which is a tea-serving robot that I built (with a lot of help!). One friend showed me how to solder plumbing parts together for the body, my brother-in-law helped me wire a rotary phone dial to the microcontroller 'brain' of the robot, and my neighbor helped me design the circuit that gets the correct voltage to the various parts. I find that projects get so much richer when you reach out to others and invite them to collaborate with you. The people around me! I'm blessed to have an abundance of creative friends who dream up all kinds of crazy ideas and then are able to manifest them into reality. In some respects, I think that each of us enables the impossible dreams of the others, since we routinely make amazing impossible ideas happen. I'm currently up to my elbows in creating about a million pocket belts and bustles for The Great Dickens Christmas Fair in San Francisco, which is the next event that I'll be vending at (it runs from the weekend before Thanksgiving through the weekend before Christmas). I also recently helped to create fan-powered moving tentacles for a giant Cthulhu stage prop for the climax of the Obtainium Works production of "The Maltese Cthulhu," a mashup of "The Maltese Falcon" and "The Call of Cthulhu." People who tell you that you're doing it wrong are themselves doing it wrong. Ask for help and input, you might be surprised at what results.